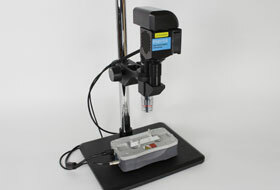 The microscope’s easy-to-use stage is designed to securely hold a wide range of Dolomite and third-party microfluidic devices, including chips, connectors and the µEncapsulator 1 module. An integrated LED coaxial lighting system offers exceptional brightness with very low exposure times, with an optional reversible mirror and diffusor, allowing production of publication-quality images. Illumination from above also leaves the underside of the microfluidic device free for temperature regulation systems, such as the Meros TCU-100 temperature controller. To simplify operation, the entire system is controlled by Dolomite’s intuitive Flow Control Centre software, allowing straightforward live imaging, adjustment and image capture.